There are now well over 1,000 colleges and universities that don't require SAT or ACT scores in deciding whom to admit, a number that's growing every year. And a new study finds that scores on those tests are of little value in predicting students' performance in college, and raises the question: Should those tests be required at all? 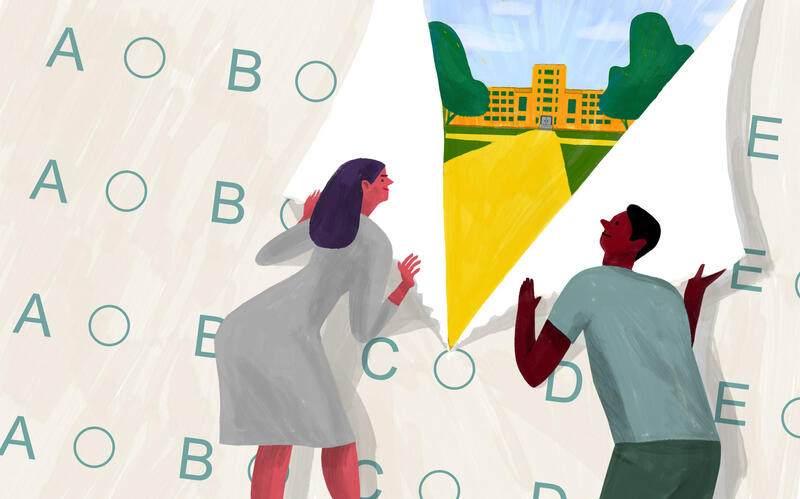 Colleges that have gone "test optional" enroll — and graduate — a higher proportion of low-income and first generation-students, and more students from diverse backgrounds, the researchers found in the study, Defining Access: How Test-Optional Works. "Our research clearly demonstrates that these students graduate often at a higher rate," said Steve Syverson, an assistant vice chancellor at the University of Washington Bothell, and co-author of the study. "When a college considers going test-optional, one of the first reactions that people, including alumni, feel is that the college will be admitting less qualified students," he added. Syverson says the study should reassure admissions officials who've decided to go test-optional. Syverson and his team of researchers studied 28 public and private institutions that no longer require test scores, and tracked about 956,000 individual student records. "I know for a fact I'm the first Nicaraguan-American, the first Latino, the first Jewish Latino that a lot of kids meet," he says. He adds that when he arrived at GW, he looked around and asked himself, "What am I doing here with kids who went to private schools and got the best education possible?" It was a very different world than he grew up in back in New Mexico. "I remember my freshman year of high school, I didn't have a math teacher. Maybe that's why you see in my test score that I didn't have a good grounding in math. But I believed my potential was still there." Ian was a straight-A student in high school, but his SAT scores were so low he didn't think any top tier school would accept him. He says not having to submit his test scores opened the doors to a top selective school. Jack Buckley, a senior vice president at the American Institutes for Research, notes that while diversity improved at schools that have gone test-optional, that also happened "at the same rate among those that didn't." Syverson says that's not what the evidence in his study is showing. "We certainly are not arguing that everyone should abolish test scores," he says. "Test scores do have some value." Syverson insists that his study shows that tests can be an obstacle not just for students who don't test well, but for students from under-served, under-represented populations. More importantly, he adds, you can admit pretty good students by looking at something other than test scores. That's been the experience at George Washington University. "Our experience is actually that (students') high school performance predicts college performance extremely well," says Forrest Maltzman, the university's provost and chief academic officer. Maltzman says that whatever helped students be successful in high school tends to work for them in college: "Standardized tests don't get at that." Two years worth of data show that students who got into GW with high test scores performed no better as freshman and sophomores than those who got in without submitting their test scores, he says. "The added value of test scores in predicting performance today is really very very minimal," Maltzman argues. "The best thing these tests match up with is actually family income." And that, says Syverson, is consistent with his team's findings. Still, he cautions that test optional policies are no panacea. They're just another way to make college more accessible. "Our study clearly supports the notion that if an institution wants to do a better job serving traditionally under-served populations, test optional (policies) can provide a very useful tool."